1999 was pretty big year for us. That was the time when Transquip Distributors (mobile tools) officially became Transquip Direct, The Online Toolshop! Having already been in the Tool supply business for 15 years, our founder had travelled extensively throughout Australia with his Transquip Mobile Tool Service. Seeing the need and potential to distribute quality Tools to rural and outback clients who didn't have access quality Tools. Also with the emergence around this time of E-commerce in Australia, the decision was made to "put the business online". You may be surprised to know that Transquip Direct is actually one of the very first fully operational Australian Ecommerce/supply businesses and as you can see, after over 16 years online (over 30 years in total) Transquip Tools is still going strong offering a great range of quality Tools to the entire nation, including many Mining, Government and other Industry clients (and naturally everyone in between as well!) We are commited to our clients and will always strive to offer a great price and speedy delivery. 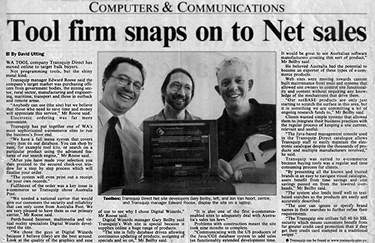 Below you will find some wonderful archived news items from around our founding period, as you can see an Online Toolstore in the late 90's and early naughties was reasonably newsworthy!